If you ever wondered what an SUV built by Ferrari would look like then you can stop thinking because, it’s here. The Alfa Romeo Stelvio was recently unveiled at the LA Auto show. Alfa Romeo known for its sporty cars has named the SUV after the Stelvio pass bordering Italy. They claim that it will be the fastest SUV ever to traverse Germany’s famed Nürburgring — it’s the fastest in company simulations, but it apparently hasn’t yet made the journey to Nürburg for an on-track record attempt. It is built on the same ‘Giorgio’ platform as the Giulia which means the longitudinally mounted engine sits in the front and drives the rear wheels or all the four. And drives all four wheels thanks to Alfa’s Q4 all-wheel drive. The chassis gets a large dose of aluminum and strives for the ideal 50/50 weight distribution between the front and the rear axles – something that sports cars strive for. It’s part three of the Alfa Romeo ‘reboot’ that began a few years ago with the incredible 4C sports car and was followed with the Giulia sports sedan. 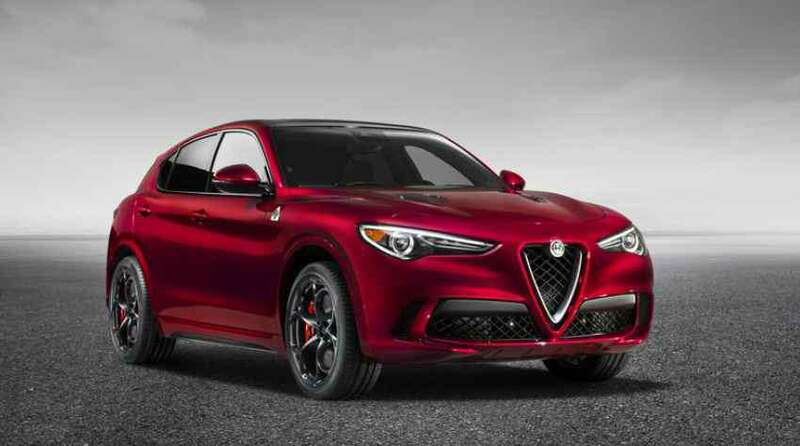 Alfa says it’s the fastest SUV in its class within the top-level Quadrifoglio trim. The Stelvio certainly gets the new 2.9-litre 503bhp twin-turbocharged Ferrari V6 engine from the Giulia’s Quadrifoglio that has had the automotive world in smiles. You also have a 2.0-litre turbocharged four-banger petrol that develops about 280bhp of power and 400Nm of torque for your daily runs. Simply put, it can do an estimated 0–60mph time in 3.9 seconds. There is an option for a diesel engine as well. The 2.2-litre Multijet diesel engine should be available in 207bhp, 470Nm setup as it is the only diesel Q4 setup. Globally, the Stelvio should be available with the six-speed manual and the eight-speed automatic gearboxes across all the engines and trims. In terms of looks, the typical Italian beauty is defined by the flowing lines and the classic triad grille fascia. The center grille is taller and gets chrome lining while the slim swept back headlamps extending right across the fascia. The projector units get LED daytime running lamps. The design is simple yet stylish with creased long-ish bonnet, a twin-cab profile and slightly flared wheel arches. The Stelvio is not very tall and Alfa says the height has been restricted to match the driving dynamics to Alfa’s lineage. Inside, the Stelvio will be plush with black themed leather upholstery that gets highlight stitching. The twin-pod instrument cluster reads revs and speed, 320kmph, in case of the Quadrifoglio. It gets a TFT screen between the pods that reads all the vitals and any other information that you may need. The touchscreen on the center console will be 6.5 inches on the standard car while the top-spec car might get the larger 8.8-inch touchscreen. The red push-button for start sits on the steering just like a sports car and it will get driving modes for the higher performance trims. The Stelvio will compete with the Porsche Macan and the Mercedes GLC AMG amongst performance SUVs. The price tag is yet to be announced and the Stelvio is expected to be launched globally by the end of 2017.